"We are the Teenage Mutant Ninja Turtles. We strike hard and fade into the night." 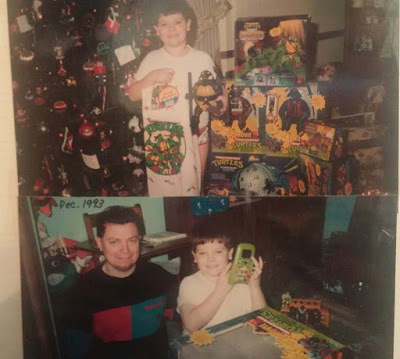 As obsessive of a fan as I am of Doctor Who now, it's nothing compared to the Ninja Turtle fanboy I was when I was a child. In truth, the Teenage Mutant Ninja Turtles was the first thing I became consciously aware that I was a fan of. Sure I enjoyed Winnie the Pooh, Inspector Gadget, Alf, and various movies... nothing was quite as amazing as the Ninja Turtles. In the early 90's Ninja Turtles were an onslaught on people's consciousness and wallets and I was stuck right in the middle of it all. I had mountains of toys, several VHS tapes, Turtles clothing and bed sheets, I even had my parents paint my room green! To my delight, the Ninja Turtles struck a chord with many people and are still being rebooted and continued to this very day. Somehow Kevin Eastman and Peter Laird had produced something that has truly lasted and will most likely keep being brought back every few years when someone gets money or another idea. However, all of these reinterpretations have been met with mixed results. I'm especially talking about the Michael Bay produced Ninja Turtles movies. I will admit that I originally boarded the hate train with the first movie before even seeing it; something that I actually regretted doing. The film was neither a masterpiece nor the greatest film in the franchise...but it wasn't all that bad. The sequel was released only a couple weeks ago and just like its predecessor, it is being dashed and hated by most of the critics that I have watched/noticed anyway. I have yet to see this new installment in the franchise but I shall at some point. So if you happen to be disappointed in the latest Ninja Turtles movies but would like to see some Turtles action...well then watch the 1990's live action Teenage Mutant Ninja Turtles as it is truly superior in most ways. However, if you want to see something a bit different while still being good then you should check out today's entry, Turtles Forever. Turtles Forever is the 25th anniversary celebration of the Teenage Mutant Ninja Turtles. 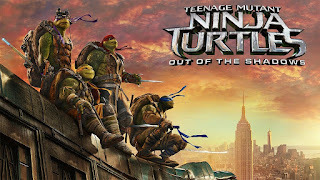 It is a 2009 animated movie which features the 2003 incarnation of the Turtles teaming up with the 1987 incarnation of the Turtles involving various characters and technology from both shows... as well as a third set of turtles. Let's take a closer look at Turtles Forever shall we? Master Splinter is alerted to a news report being plastered on TV that his pupils, the Ninja Turtles, were captured on tape fighting a group of thugs known as the Purple Dragons. The Turtles have no knowledge of this confrontation and head to Purple Dragon HQ to investigate. While there, they find these doppelgangers are actually themselves from the '87 series' dimension. 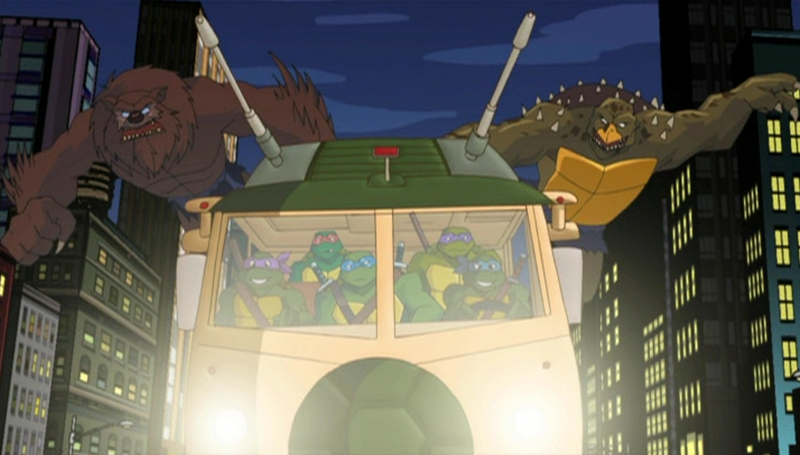 The '03 Turtles rescue their '87 counterparts, but a small canister of ooze splashes on one of the Purple Dragons in the scuffle. 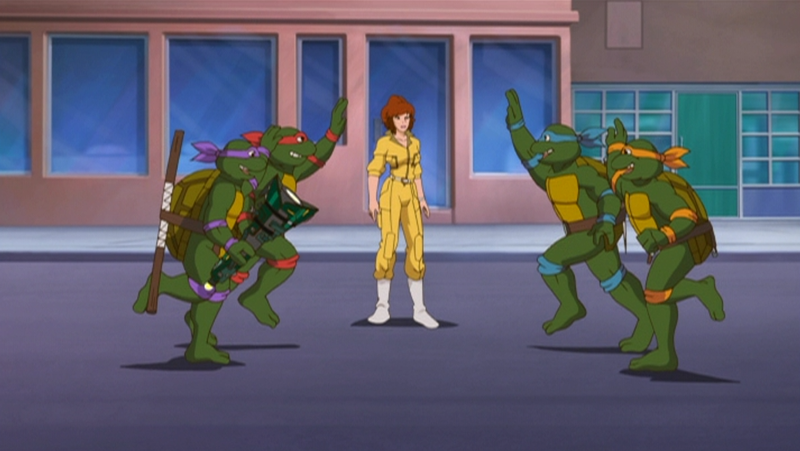 The '03 Turtles ask for an explanation but are forced to call backup when the '87 Turtles decide not to talk and instead get some pizza. They openly walk among the crowd, causing panic in the streets and eventually forcing Splinter to set a trap for the '87 turtles. 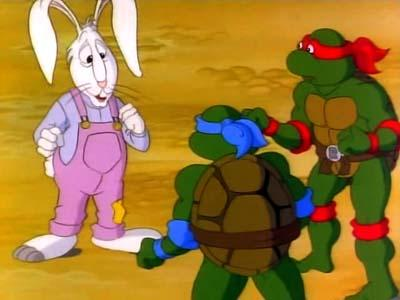 Seeing their sensei look so bizarre makes the '87 Turtles reevaluate everything that has happened since last night and '87 Leonardo explains. The night before, they were fighting Shredder over the mutagen Donatello was currently carrying. The fight concluded in Shredder's Technodrome, but the dimensional teleporter malfunctioned and it must have shot not only the Technodrome but these turtles to this other reality. Following the recent increase in seismic activity, both Donatellos track down the Technodrome underneath New York City. Shredder notices the eight turtles and manages to escape. The '87 Turtles decide to build a dimensional portal device to head back to their reality and get some anti-Technodrome gear. Meanwhile, Shredder uses the knowledge he just gained to track down that dimension's Shredder as well. '87 Shredder finds the '03 Shredder frozen off world and uses the teleporter to bring him back but discovers that not only this dimensions Shredder is a pink alien similar to Krang (who is pleased) but also that the '03 Shredder is far too insane to work with. 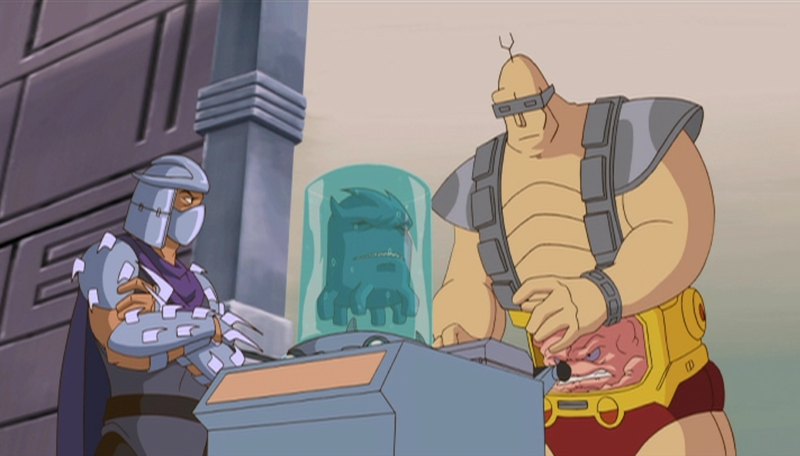 Krang and '87 Shredder gas the '03 Shredder and intend to cut him open and study him. However, '03 Shredder's adopted daughter Karai breaks into the Technodrome and releases him as she had been closely monitoring his exile. On the surface, The Turtles and Splinter are attacked by the Purple Dragons and their leader Hun. Hun wants the mutagen that '87 Donatello has on him as the previous vial turned his man into a gigantic dog mutant. 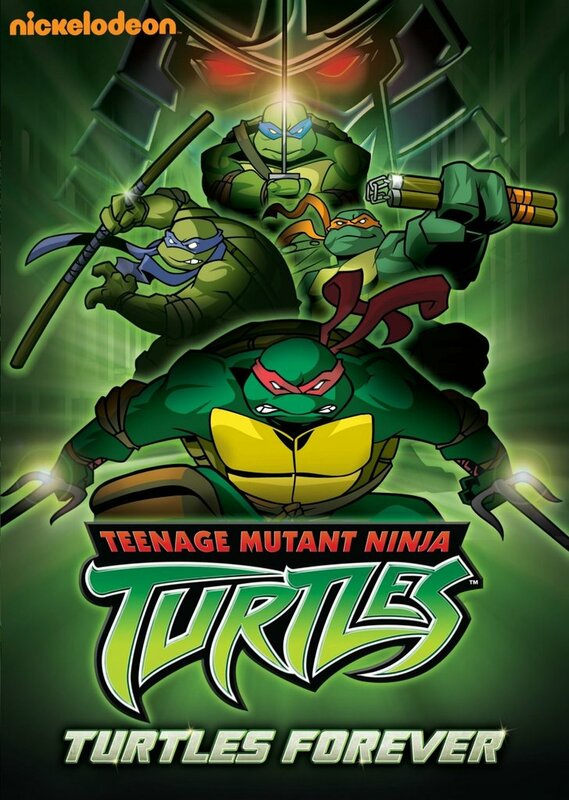 The Turtles manage to escape but only after Hun is exposed to the mutagen himself and becomes the very thing he hates the most... a mutant turtle. Hun wanders around the sewers in his new form before running across the Technodrome now being ruled by the '03 Shredder who has created a new humanoid exoskeleton. 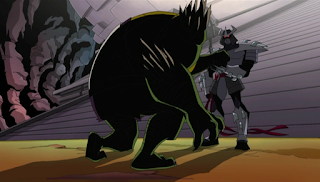 '03 Shredder offers an alliance with Hun and sends him, Bebop and Rocksteady to the Turtle's lair to capture them. Meanwhile, '03 Shredder has been upgrading the Technodrome to be extremely lethal and effective. He has also upgraded the Foot Soldier Robots as well as replicated the mutagen and turning his human Foot Soldiers into mutants. He then uses the Technodrome's computer to learn about parallel worlds and other dimensions. Hun, Bebop and Rocksteady attack the Turtle's base and capture Splinter as the ceiling begins to collapse. '87 Donatello uses the dimensional transporter device he had been building and safely sends all eight turtles to the '87 universe. 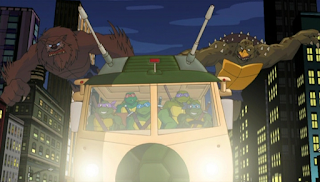 With Hun having lost the turtles, '03 Shredder keeps Splinter as bait for the turtles and launches an all-out assault on New York to drive them out of hiding. 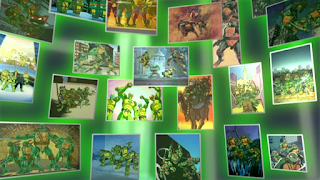 In the '87 universe, the '03 Turtles meet the '87 April and Splinter as the '87 Turtles grab their anti-Technodrome gear. 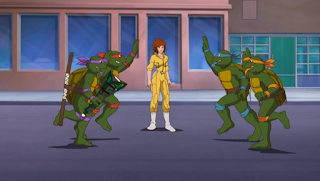 All eight turtles open the portal back to the '03 dimension where they notice April and Casey trying to repel the attacks of the upgraded Technodrome. The Turtles grab the Party Wagon and Turtle Blimp and head back to the '03 Dimension. There, they tackle many of the mutant and robotic soldiers of Shredder and head into the Technodrome to find Splinter. It is then that '03 Shredder springs his trap and begins scanning all eight Turtles. Now that Shredder has knowledge of other universes he has the Technodrome's dimensional teleporter scan the turtles so that it can find Turtle Prime, the source of all the hundreds of Ninja Turtle Dimensions there are. If he can destroy the Prime Turtles then he can destroy all of the turtles in existence at once. The Technodrome finds Turtle Prime as both sets of turtles disappear seemingly destroyed. The Technodrome travels to Turtle Prime and begins destroying that universe which causes the other universes to begin erasing itself from existence. 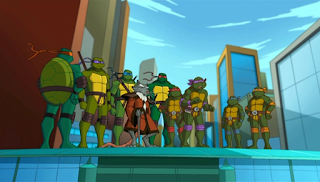 The eight turtles reappear in the '03 universe having been saved by Karai who has realized what Shredder's actions would cause. The both Donatellos work together to quickly rewire the portal device to follow the Technodrome's energy traces and teleport themselves just as the '03 Dimension is entirely erased. 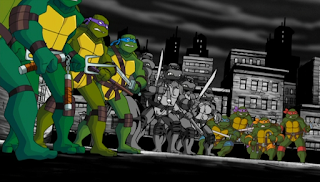 The turtles land in the black and white Turtle Prime, the setting of the original comics only to have their original selves attack without provocation. They stop once the Shredder is mentioned. The twelve turtles come up with a plan and the Prime Turtles taunt Shredder by insulting his pride. Before '03 Shredder can even leave the Technodrome, Prime Shredder appears but is comically taken out by the other turtles in hiding. 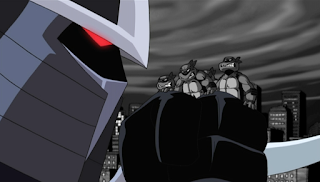 '03 Shredder faces off against the Prime Turtles who are quickly joined by the '03 Turtles, '03 Splinter, '87 Turtles, '87 Shredder, Krang and Karai. '03 Shredder uses the molecular amplification technology from the Technodrome to increase in size, but is knocked into the destruction beam from the Technodrome proving it to be his weakness. However, bumbling idiot Rocksteady accidentally unplugs the beam. '03 Shredder grabs the Prime Turtles and begins crushing them to death causing the Prime World and everyone else to begin disappearing. Shredder would rather there be no reality at all than have any of the turtles alive. The '87 team uses their anti-Technodrome exploding stars to stun '03 Shredder causing him to drop the Prime Turtles. It is at this time that Bebop plugs back in the beam thinking he was helping '03 Shredder; this destroys '03 Shredder. With the enemy defeated, the various dimensions begin to return into existence. The '87 crew return to their dimension in the Technodrome while the '03 crew return using the portal device. The Prime Turtles comment on the other turtles and decide to go for a slice of pizza. Meanwhile, in another dimension, Kevin Eastman and Peter Laird put the finishing touches on their first issue of Teenage Mutant Ninja Turtles and express the hope that the comic will sell. Honestly, they got the '87 Turtles all wrong. I'm not just talking about the voice acting here. The original voice actors could not reprise their role for the movie due to some Union garbage that was out of their control , and the guy they got to do Raphael actually sounds like the original Raphael. However the characterization of the '87 Turtles is what I'm talking about and it was all wrong. Yes the '87 series was a bit more cartoonish and childish. Yes that series had a lot more strange ideas and weird things about it but it wasn't ever that bad. The '87 Turtles wouldn't just constantly be goofing off and being childish for no reason; they wouldn't shrug off something important even for pizza. And while I know that the older show had some bizarre creatures, to showcase off a leprechaun, mutant bowling ball, and mutant banana in the '87 Universe segment was more bizarre and dumb than that original show was. Seriously, go watch the six episode Season One of the original cartoon and see how completely wrong the characterization on these guys are. It's almost like the creators subconsciously wanted to point out that the '03 series was far superior. It was just a shame because we older fans became fans because of the '87 series. They should have treated it with a little more respect. When Nickelodeon first aired this show, they cut eight entire minutes off of the run time. While nothing major was cut, those eight minutes gave some much appreciated back story to some of the actions. It explained that Karai was keeping an eye on Shredder and was notified when his body was back on Earth. It showed the turtles having a more in depth discussion about the differences in their Shredders etc. Again it was nothing massive but it was something worth keeping around just to add information to what's going on and help out some of the pacing. Nickelodeon DID add those eight minutes back in and showed the movie again on their channel, but for the DVD release in North America they left it at the version missing those 8 minutes with no plans to release the unedited version. 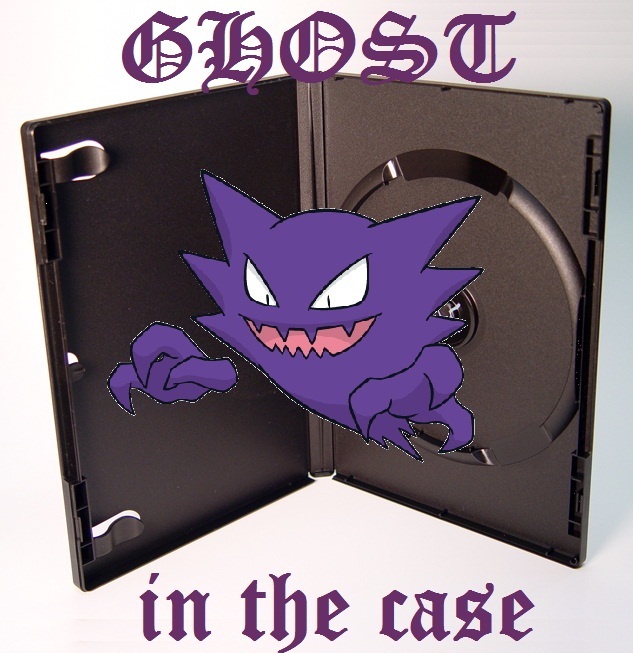 However they did release the unedited version on DVD in the PAL region for some reason. Ridiculous. I only had one positive and two negatives because I felt as though this needed it's own section. 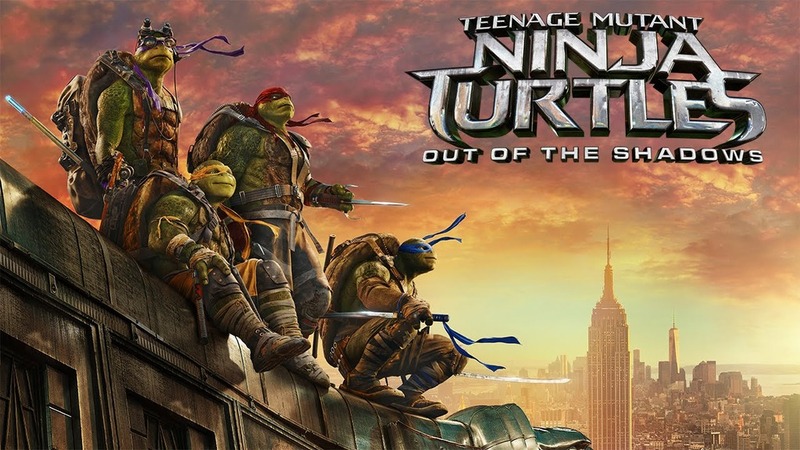 In many aspects, this movie is the perfect median for all of the Ninja Turtles as a whole. It's a great middle ground for getting into the franchise. Why? It's equal parts goofy, funny, serious, bizarre, intense, containing ridiculous science, and awesome. Which is honestly what most of the rest of the franchise can be in varying amounts. Fans of the Ninja Turtles often forget some of the more...nonsensical elements of the franchise. They forget the beginnings and some of the more strange elements. The '87 Cartoon Series was originally created to sell toys and many of the characters would be released for purchase before a story was even written around them. The same cartoon series had nonsensical science that would never come close to happening coupled with bizarre things like The Easter Bunny being an in-universe character. The '90 movie which is seen by most as the pinnacle of the Ninja Turtles movies has the main villain getting teenagers to steal stuff because....who knows. He didn't really have an endgame here. The second movie was anticlimatic as can be while the third movie was just bad. The TMNT movie was basically a turtles version of the 13 Ghosts of Scooby Doo. At the same time, many things are fantastic with the film. The original comics were harsh and gritty. The '90 movie had some of the best puppeteering I've ever seen. Certain incarnations make April an awesome fighting member of the team. It's great to see the Michael Bay turtles doing weird stuff in "real life" that they couldn't have done with puppets. The '03 series was far darker and closer to the comics. The '12 series actually made them act like Teenagers. There's a lot of good and bad but the franchise has never been perfect...that's the same with this film. It's certainly not perfect but it will give you a good taste of whether you will like this franchise at all once you watch it. I'm glad this was made and I'm glad that I watched it. While they did get the '87 Turtles wrong it was still a good representation of all things Turtle. If this would have been the last thing ever made for the Ninja Turtles, I would have been find with it as it went out with one heck of a bang. Fortunately it seems that the Turtles are going to keep going strong on into the future. If you are interested in the Ninja Turtles at all and want to see something pretty amazing then you should definitely check this bad boy out!